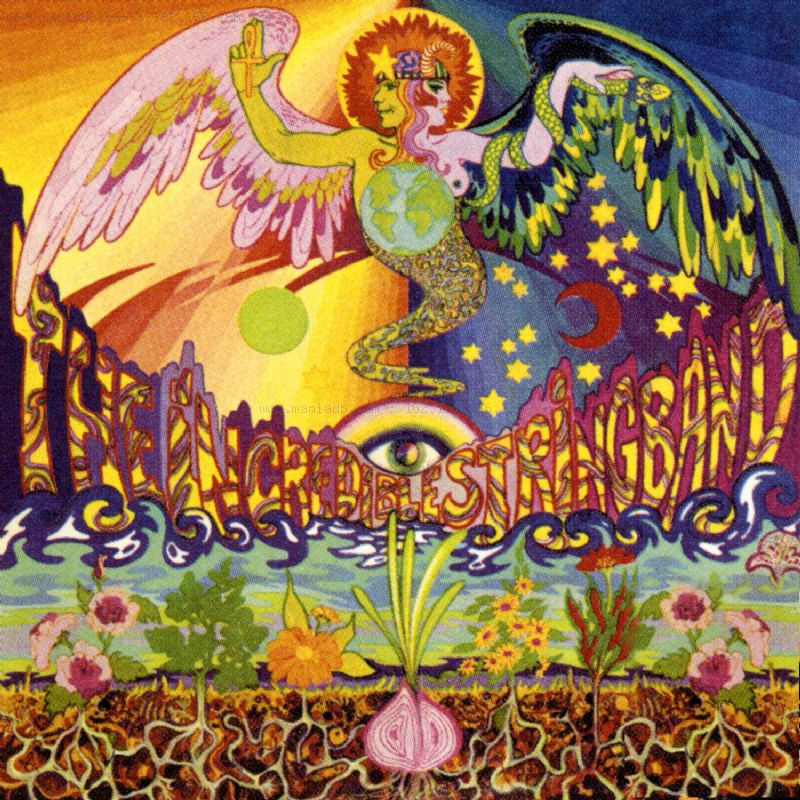 The Incredible String Band and their producer, Joe Boyd, managed to bottle up everything that was groovy about their previous album and lace it with some prime Supercool. The sound of the recording is notably beefier and more nuanced, and both Robin Williamson and Mike Heron's songwriting and actual singing voices seem to blend together a bit better here. Although the album cover can't touch "5000 Layers of the Onion," this is arguably the sonic apex of acid folk in general. With the musical synergy seemingly in full effect, this album lacks the ping-ponging song credits of the last album. Instead, we start off with a clutch of Williamson's songs. "Koeeoaddi There" is likely the group at its catchiest (although I doubt this could manage much radio play), although Williamson does amusingly randomly bounce around from one theme to the next, but it's balanced by the great trancey guitar work. There's some really entertaining vocal affectations and call-and-response on "The Minotaur's Song," and it ends up sounding like something the villagers from "the Wicker Man" (the Christopher Lee one, not the Nick Cage one) would have rocked through in the pub on a Saturday night. Heron clocks in with the first of the band's epic length tracks, "A Very Cellular Song" (unfortunately, I can't help but think of mobile phones here in the future). I'm not sure it really justifies its 13 minute length, but the various, droning sections and oddball sound effects remain entertaining. Personally, I dig Heron's percussive and concise "Mercy I Cry City." Williamson is a little more tentative with his epic track only clocking in at eight minutes, but his sitar infused "Three is a Green Crown" ranks as one of my favorite tracks here. 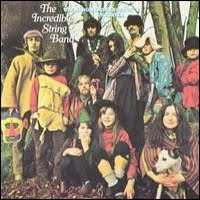 "The Water Song" provides some very groovy pads of woodwinds, but do they really fit with the Incredible STRING Band?...... yes, they do. If you have any need for some acid folk in your life, this very well be the best place to go. This is the ISB at their best as an acoustic unit. After this, they'd start mucking around with a few electric instruments, and eventually end up as more folk-rock sort of band. They never really did the electric thing as well as Dylan, however, and this album stands tall as their masterpiece. First off, this is one of the most awesome albums ever. I first picked this up while in high school in the mid 90's as it looked to be a notable freak out and I'd heard the band's name spoken of in reverent tones. Unfortunately, I hadn't even gotten to electric freak outs like 'Piper at the Gates of Dawn' yet, and have to admit that I didn't really 'get' this one for years. This is straight up acid-folk, without any electric embellishments. Of our main duo, Mike Heron tends to walk more the Dylan/Donovan continuum, although with his own voice very loud and clear, while Robin Williamson is more like the crazed minstrel hopping out at you from atop a tree in a fog-filled primordial forest (although they admittedly do drift into the other's role on occassion). Both of the excel in writing completely tripped out whimsically British lyrics that make Syd Barrett look like a rank amateur - not that Barrett isn't awesome, but the lyrics of "The Gnome" don't do well when placed next to "The Mad Hatter's Song." Williamson had also recently taken the hippy tour to North African, and sounds from that area abound as well as the sounds of other incredible stringed instruments such as the sitar. If your ears are open to the folk scene, you'll find this album is packed with absolutely top-notch songwriting. In fact it's far easier to talk about what doesn't quite do it for me. "Blues for the Muse" tries really hard to stretch the 12-bar blues somewhere interesting, but this group still fares much better with the British Isles folk template than the blues. "My Name is Death" take the 'death' concept a bit too literally sonically, and it sort of drags the song down. Although it's only 2:46, it is the longest song on the album (despite some tracks running 5:40 or 4:05 or something; I can type more numbers if you like). Fortunately the list of winners pretty much includes everything else on the album. I particularly dig the first four tracks, "First Girl I Loved," and "You Know What You Could Be." If I ever ran the Renaissance Fair, you'd eat mushrooms instead of a turkey leg, and then you'd listen to this band. There'd also be giant, iron robots there. Just for a bit of name checking, this set had psych/folk guru Joe Boyd in the producer's chair, and the legendary string bass player Danny Thompson shows up on several tracks. 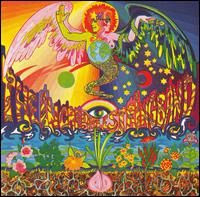 Basically, as far as acid folk goes, this album is setting your rear in the middle of the royal court. And let's just mention that phenomenal album cover one more time. I should get it tattooed on my brain or something. Huh, huh... yeah! I'm a little hesitant when I come across the term 'prog rock.' When musicians can work it towards a spacey groove rather than multi-suite wankery, though, that form of music does get my attention. With that in mind, we'll peg this one as a 'prog rock' classic. 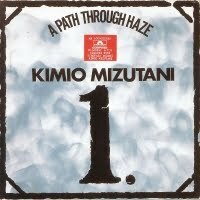 Kimio Mizutani was a psych rockin' session guitarist who created this album for his solo debut. He's got pretty awesome chops, and collaborated with some classical chamber groups on this album. Typically, the classical prog turns me away as well, but the band is smart enough to respond to the more orchestrated moments with a jazz vibe. Even Frank Zappa, who often recorded this way as well, tended to miss the point when he'd have his guitarists play rapid-fire walls of intricate guitar when a melodic solo would have done nicely. Mizutani doesn't make this mistake. This set starts with several awesome tunes. The opening title track does indeed provide some nice jazzy haze, cut straight through with a monster riff from Mizutani's guitar supported by some groovy, Ginger Baker-like drums and streams of strange electronic noise. Once "Sail in the Sky" gets going, we're treated to a fusion vibe which features a very complementary woodwind arrangement. "Turning Point" sounds surprisingly like the post-rock band Tortoise, who wouldn't start recording until about 25 years after this album was released. "One for Janis" might not be the best tune for Janis, but it does give us another riff monster which is pretty fun. On the lesser side "Tell Me What You Saw" veers into hamfisted atonality which actually sounds pretty much the same as Phish jamming (although I'm sure that's a positive point for some of you), and "Way Out" doesn't tend to fit in very well as the only track with vocals. It comes out sounding like early-Return to Forever's vocalist stumbling into a funeral as the music is rather dirge-like. Yeah, so this is prog-rock that I can be down with. The jazz vibe seems beamed in from the Canterbury scene, while the construction recalls Zappa, although without the 'too many notes' problem. Also, Mizutani is more than sharp enough to have a few of his own tricks up his sleeve and his guitar playing is psychedelically impeccable. I'm going to go ahead and guess that this release was intended to latch onto the coattails of Ravi Shankar's appearance at the Monterrey Pop Festival (in fact, Ravi's 1968 release was 'Spirit of India') along with a general interest in Eastern mysticism. Fortunately, this is no exploitation release, but legitimate Indian musicians doing their thing. Kalyani Roy was one of the few female sitarists at that time, while Ali Ahmed Hussain is wailing away on a shehnai, which is a wind instrument that sounds somewhere in between a violin and a horn. You'll get the needed dose of tabla pounding as well. Expect a completely traditional affair, with no postmodern touches or anything. There's only three tracks here, so you're either 'in for another long raga' as Krusty the Clown would say, or you're not. If you're down for this kind of thing, this album is an affair with lots of color added to the general raga vibe courtesy of the shehnai. I enjoy the whole thing, but honestly, I don't know enough about classical Indian to really distinguish much between the tracks. They all seem to more or less go down the same sonic path - but the trail is clearly being led by master musicians. I've played this collection often, and I've sort of considered it one of my 'mind bubblebaths.' I don't tend to fixate or concentrate on the actual music much, but it creates a cloud of sound that I find very appealing. I'm sure there are some major musical point or accomplishments that I'm totally missing here, but something about the spirit of the recordings has definitely burrowed in my brain.